What to do on Pancake Day in London. Even though Valentine’s Day is this weekend, a stroll through any Sainsbury’s or 99p store will provide not-so-subtle reminders that Easter is the next holiday coming up. For most Christians, that means Lent is just around the corner as well…and so is Mardi Gras (which means ‘Fat Tuesday’ in French). Mardi Gras, also known as Carnaval in many countries, occurs the day before Ash Wednesday. Ash Wednesday marks the beginning of the Lenten season, a period of fasting and spiritual preparation for the celebration of Easter 46 days later. Mardi Gras is the last day for Christians to indulge in fatty, rich foods before the more austere, penitential period of Lent begins. However, England has their own, less-lewd-more-delicious celebration: Pancake Day! Pancake Day is officially called Shrove Tuesday, and is most prominently celebrated in the UK, Ireland, Australia, and Canada. ‘Shrove Tuesday’ comes from the word ‘shrive’, which means ‘to confess’. Pancakes became associated with the day before Lent as a way to use up rich foods like eggs, milk, and sugar before the fasting of Lent began. And for all you pancake lovers out there, mark your calendars: Shrove Tuesday is 17 February 2015…NEXT TUESDAY!! A day specifically dedicated to indulge in pancakes? I’m in! So rather than fly to NOLA in the States, or to Rio in Brazil, celebrate Pancake Day right here in London. The Great Spitalfields Pancake Race raises funds for London’s Air Ambulance. Teams of 4 suitably dressed up (or down) gather to compete for the honor of becoming this year’s champions. They race up and down Dray Walk and prizes are awarded to the winners, runners-up, best dressed team and best behaved team. 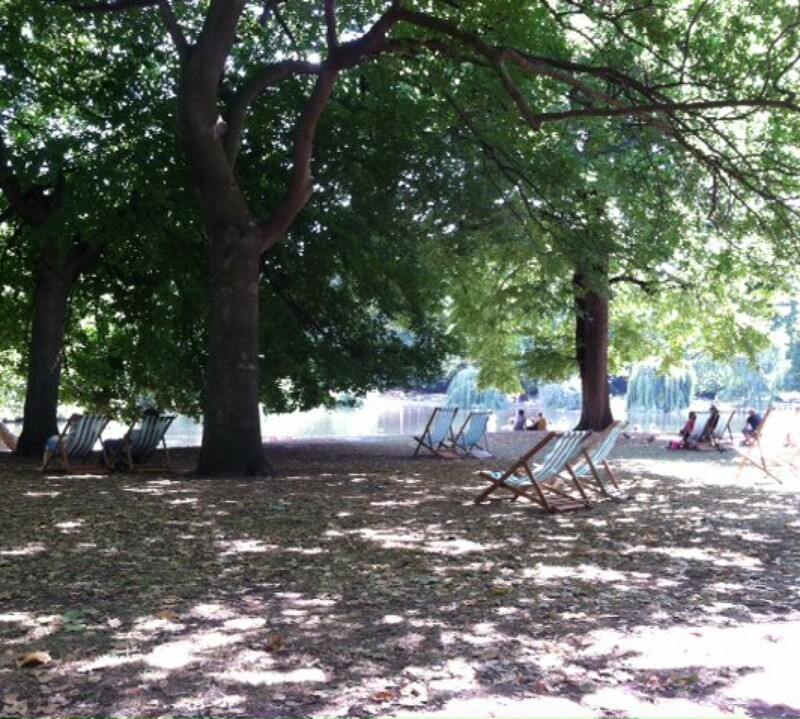 To enter a team email info@alternativearts.co.uk There’s a free hot pancake for every entrant! The Parliamentary Pancake Race has served to raise awareness of the work that Rehab does in enhancing the life chances of people with disabilities and others who are socially excluded in the UK. 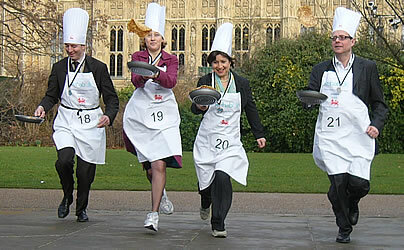 MPs (Members of Parliament), Lords and members of the Parliamentary Press Gallery gather in Victoria Tower Gardens, next to the Houses of Parliament, where they swap their warm coats and woolly caps for aprons and chefs’ hats and race around the course while vigorously tossing their pancakes in the air. The Better Bankside Pancake Day Race supports Paintings in Hospitals, a local charity that places fine art in clinical settings. Every year their work brings comfort and reassurance to over 1.8 million people across the UK. Put forward a team or come and support members of the Bankside business community as they show off their pancake-tossing skills at our annual Charity Pancake Day Race. 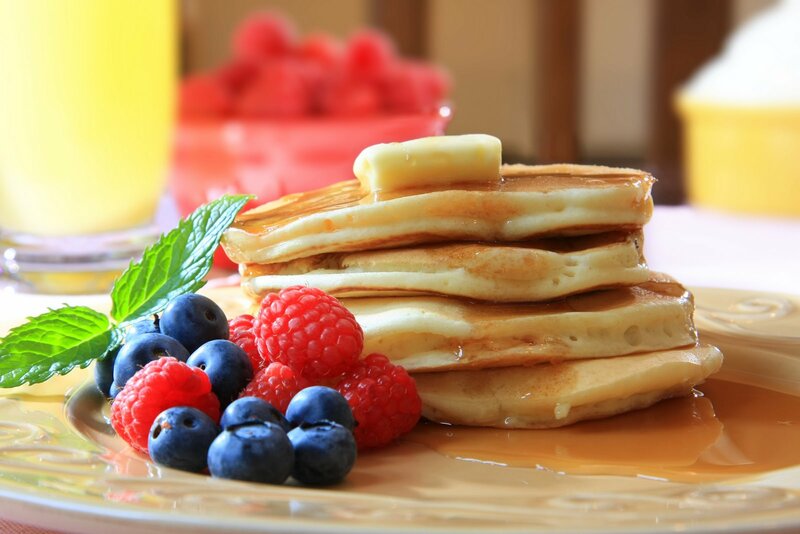 American Pancake Recipe – makes fluffy and thick pancakes. European Pancake Recipe – thin, pliable pancakes (aka crepes). Feeling ambitious? Try out some of the interesting variations on BBCgoodfood’s Pancake Day page. 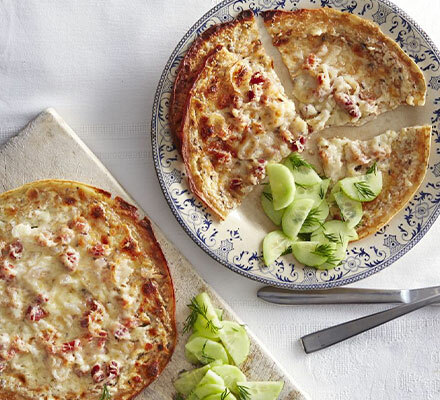 German-style cheese and bacon pancakes, anyone? Fat Tuesday doesn’t have to mean a skinny wallet…TimeOut put together a great list of eateries and included pricing guides. The London Evening Standard also put together their best-of list for London pancake restaurants and features several that I can vouch for (M1lk is just a few blocks from my flat…come visit and I’ll take you there!). Takeaway Tidbit: Whatever you do, make next Tuesday the most Pancake-y day of your year so far.